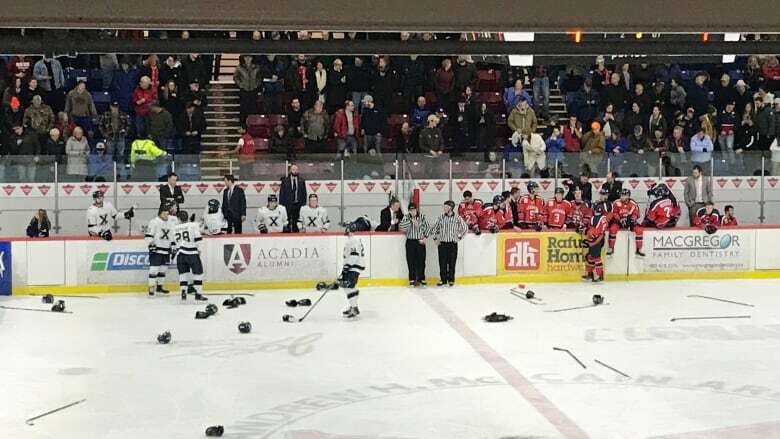 University hockey fans witnessed a brawl between members of the Acadia Axemen and the St. Francis Xavier University X-Men in Wolfville, N.S., on Saturday evening — and videos of the incidents are spreading rapidly across social media. Videos show players on both teams throwing punches, grabbing jerseys and hurling insults at one another. One player from the Acadia team can be seen hitting people with his hockey stick from the bench. WARNING: This video contains offensive language. The referee and coaches appear to try and break up the fighting, but it's unclear in the videos what started it all. At one point, head coach for X-Men Hockey, Brad Peddle, is seen standing above the dividing glass, yelling at the Acadia bench. "You get control of it. This doesn't happen. This does not happen," Peddle screams at one of the coaches, who throws back an insult in response. Several videos of the incident have been shared, viewed and commented on hundreds of times. 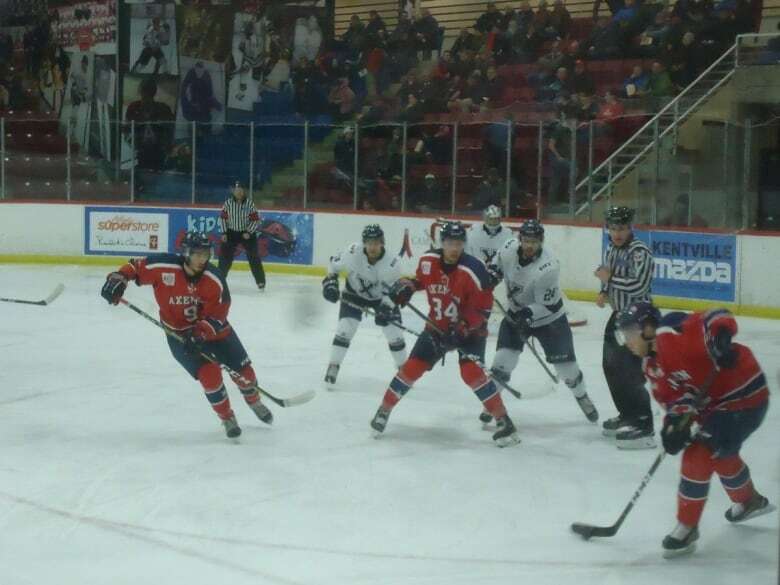 The Axemen Hockey twitter account shared updates throughout the game, saying both head coaches, as well as a number of players, were ejected from the game. The game recap on the Acadia Axemen's website says 13 players — eight from St. FX and five from Acadia — were ejected and 310 minutes in total penalties were handed out. Robb Hawley, who's been watching Acadia's game since moving to Wolfville almost three decades ago, said he's never seen anything like this. "Things were getting a little bit ugly, there was pushing and shoving and words and that. Then one fight, then another fight," he said. "It looked like something right out of Slap Shot, the movie. It was just like, oh my god." Hawley said the coaches seemed to be pretty involved as well. "Tempers were flaring. But they were grabbing their players from going over the benches," he said. "So that could have been a lot worse if they hadn't done [that.] I was seeing a lot of sticks up in the air and fists." Nineteen-year-old Nick Bennett was in the stands cheering on Acadia on Saturday. He said things seemed pretty rough for most of the night, but it was during the third period when things got more intense. Bennett said Acadia was about to take the face off, when a St. FX player skated over to the Acadia centre and "hit him a few times. And everything kind of started from there." He said the fight itself lasted about five or six minutes. "The crowd just kind of erupted. I don't think I've heard the crowd there get that loud in years," Bennett said. "I heard a bunch of different reactions. There were people that were in shock and others that just wanted them to keep going." "There was no rough stuff because there was nobody left to penalize," he said. "I'm thinking we're going to be getting some suspensions out of this one." Phil Currie, executive director of Atlantic University Sport, said in an email that AUS is aware of the incident and it is being addressed. "We take this matter very seriously. Our top concern is always the safety and well-being of our student-athletes," he said. "The incident is currently being reviewed by our AUS men's hockey commissioner who will then hand down supplementary discipline, where appropriate, in accordance with our men's hockey regulations." Men's hockey: StFX and Acadia exchange 3rd period goals and Acadia now leads 5-3 with 4:50 left in the game. Benches are very short due to a mid-period line brawl that delayed the game. Jessica Burns, communications manager for Atlantic University Sport, said incidents like this are reviewed by the AUS hockey commissioner and the executive director when necessary. The AUS website states in its playing regulations for men's hockey that major penalties include fighting, checking from behind or checking to the head. It also states any five-minute major penalty is a game ejection and a one-game suspension. Any five-minute major penalties, "as well as any match and gross misconduct penalties," are automatically subject to AUS disciplinary review. Leo MacPherson, director of Athletics & Recreation at St. FX, said in an email that AUS is the lead on discipline in these matters. "We are very upset with the incident last night and the events inciting it. We have asked the AUS to look into this incident and determine how it happened." Acadia spokesperson Scott Roberts and athletic director Kevin Dickie would not comment and referred the matter back to AUS. Neither team's head coach responded to email requests on Sunday. Acadia won the game 6-3. It is possible the teams could face each other in the first round of the playoffs later this month. And Hawley said he hopes this doesn't set the tone for future games. "I just hope it calms down in time for the playoffs."